The Anna Fascitelli Fitness and Wellness Center at the University of Rhode Island has offered a program titled “Writing for Wellness” for two years now. The program is open to all students and aims to “encourage students to use various forms of writing to enhance their well being.” Participants do “prose, poetry, and journaling” among other forms of writing. The program was pioneered by a professional yoga instructor at the center by the name of Angela who remains in charge of the program. Specialist of Fitness and Wellness Denise Robbin and Angela decided to title the program “Writing for Wellness” and held the first session on Sept. 16, 2016. Robbin states that attendance at the meetings varies, but is “generally a small group” but that the group is a “strong group,” that has “established its own community” and in a way acts as a “support group” when participants share their writing with one another. This program provides a safe space for sharing writing. Students don’t have to consistently come to meetings and can “drop in any time” to join. At the sessions, you can share writing, participate in discussions or just listen to one another’s stories. “Almost all of our programs are student led and are very student-driven,” states Robbin. 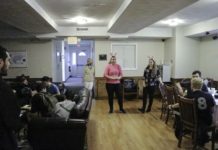 Regarding other programs advocating for mental health, Robbin is open to incorporating any other programs students may be interested in facilitating or attending at the Anna Fascitelli Fitness and Wellness Center. The Wellness Resource Center in The Anna Fascitelli Fitness and Wellness Center is available for anyone looking to “work on their wellness.” This center offers coloring books, playdough, origami, rocks to paint, a meditation station with a zen garden, and noise-reducing Bluetooth headphones to borrow to reduce stress. More events for wellness being facilitated by the center in the future include a sound healing immersion, Over Stress Less Week, Reading Day, Do It Yourself body scrubs/bath bombs, and origami ornament making. Robbin calls these “mindless/mindful activities… where you have to focus your attention and let everything else go.” Denise Robbin stressed most of all that the center is “encouraging connections with others” through its wellness programs and hopes to include more programs such as Writing for Wellness in the future.